Florida was bound to happen. It was only a matter of time. My family lives there, umpteen birds winter in the tropical region, and it’s freezing in Portland. 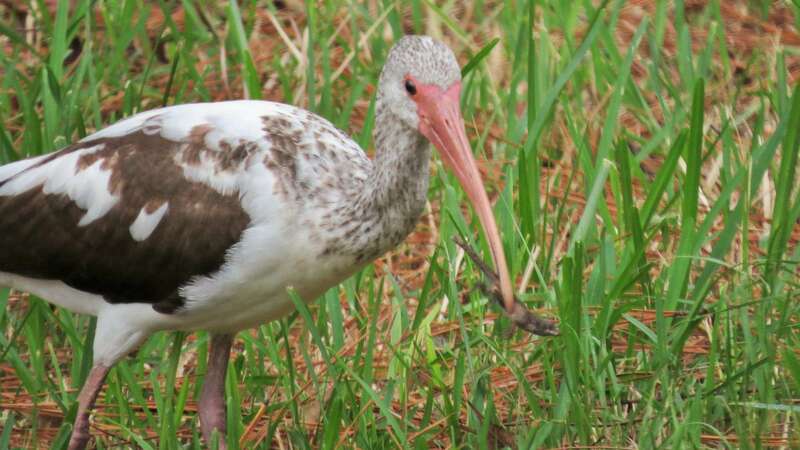 I spent a week warming up, visiting family, and getting to know Florida birds. 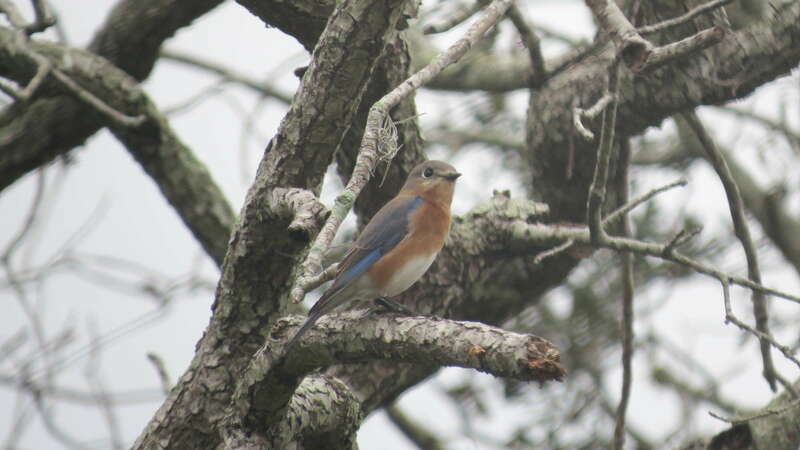 Growing up in the Tampa Bay area I would occasionally notice Blue Jays and Northern Cardinals, but it has taken a decade of dark, rainy, Pacific NW winters combined with a new love of birds to truly appreciate my hometown. 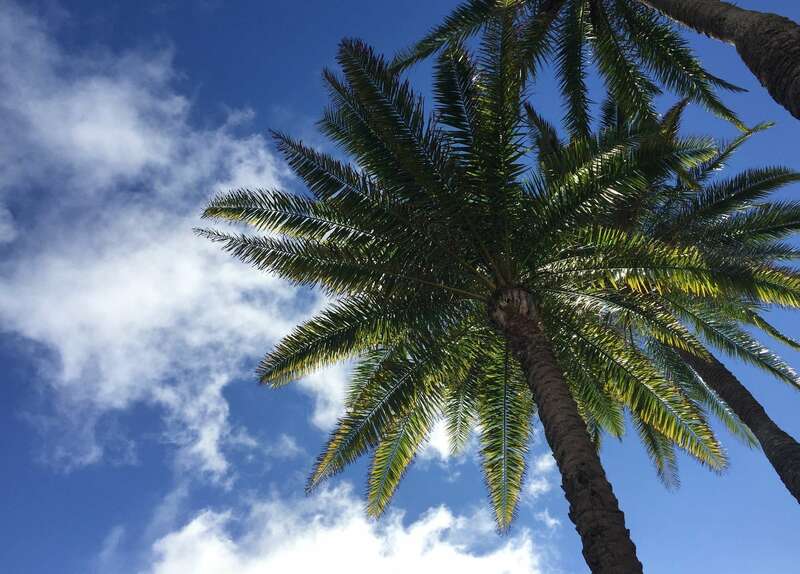 Sunshine, palm trees, and birds in November? Yes, please! 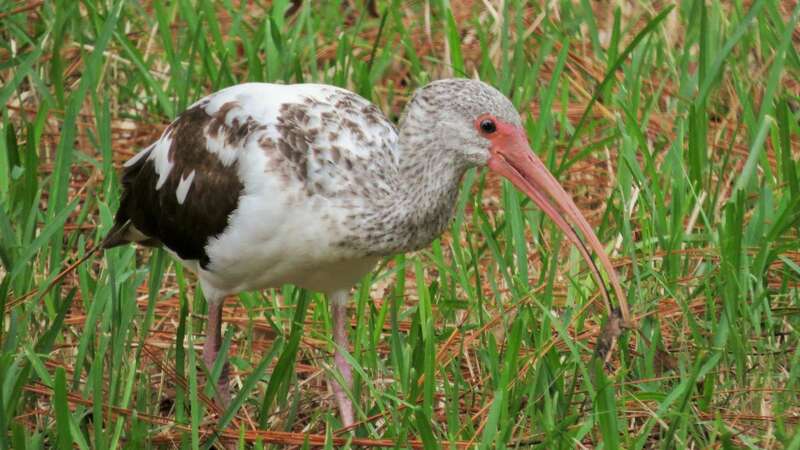 My mom and I went for a walk around the neighborhood, and spotted numerous birds, like the elegant White Ibis. This species has acclimated to suburban life pretty well. They nest and feed near humans, and they greeted us each morning on the lawn. In aquatic habitats, they eat fish and arthropods like crayfish, and on greenspaces they forage for large insects…and lizards! No kidding. 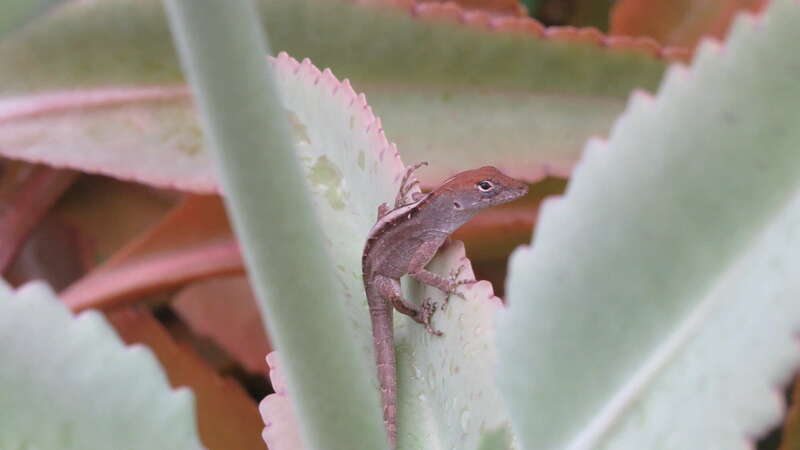 I caught this juvenile with a brown anole gripped in its bill. 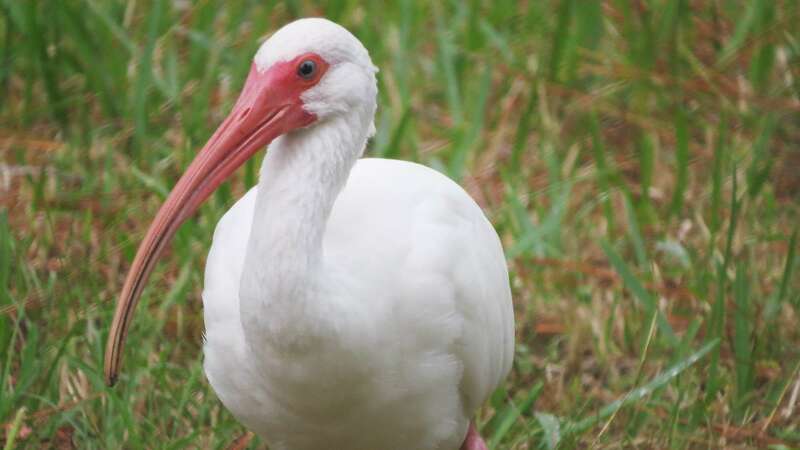 Good for the ibis, sad for the lizard. I miss living around those cutie-pie little reptiles. They liven up sidewalks, fences, shrubs, pretty much all surfaces in Florida. As a child, they provided hours of entertainment; I’d catch and play with the mini-dinosaurs by the handfuls. But I digress. 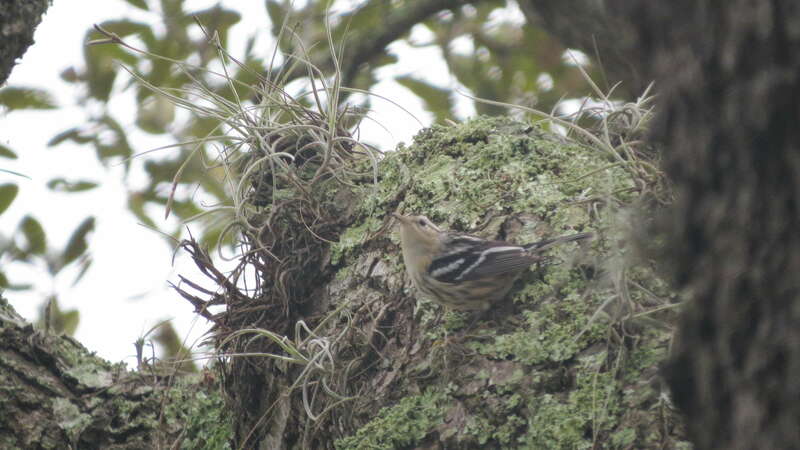 Back to birds, like the Palm Warbler! They were everywhere. Sporting their winter plumage, they flittered around on driveways, lawns, shrubs, and even roofs, as they showed off their yellow undertail while making their signature tail wag. 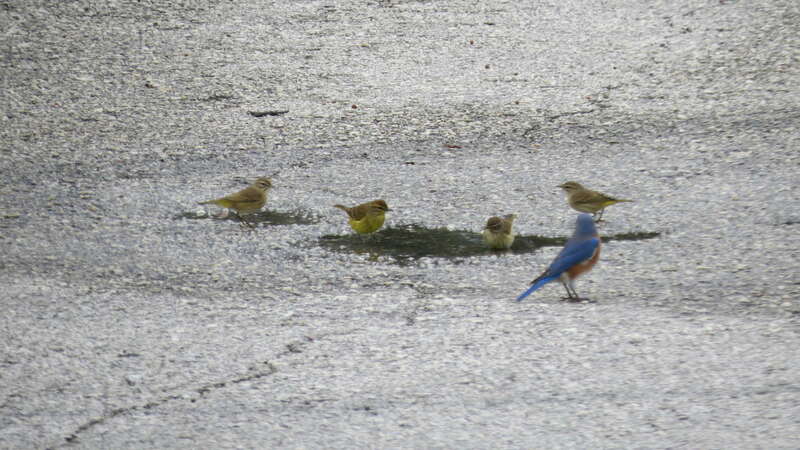 And I saw grackles, phoebes, and mockingbirds – oh my! So fun. On our walk we also saw three woodpecker species, a Downy Woodpecker, and two new woodpeckers! A Yellow-bellied Sapsucker (juvenile) and a Red-bellied Woodpecker. Rain was in the forecast, but we continued along to the University of South Florida Botanical Gardens. 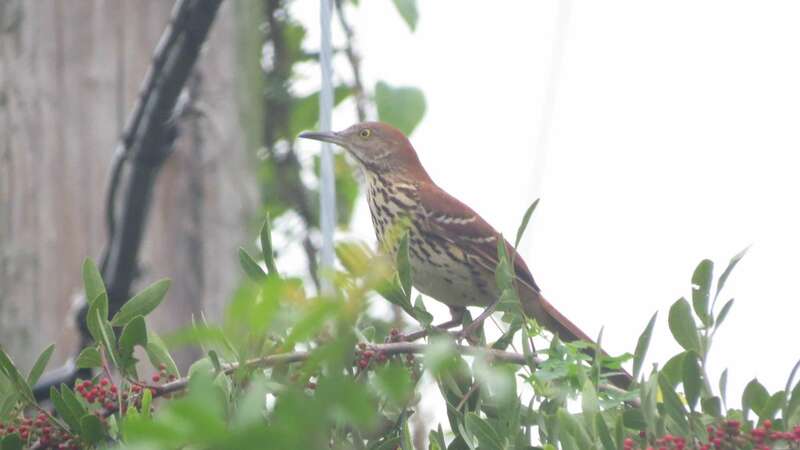 Along the way, we spotted a Brown Thrasher! Lucky sighting. 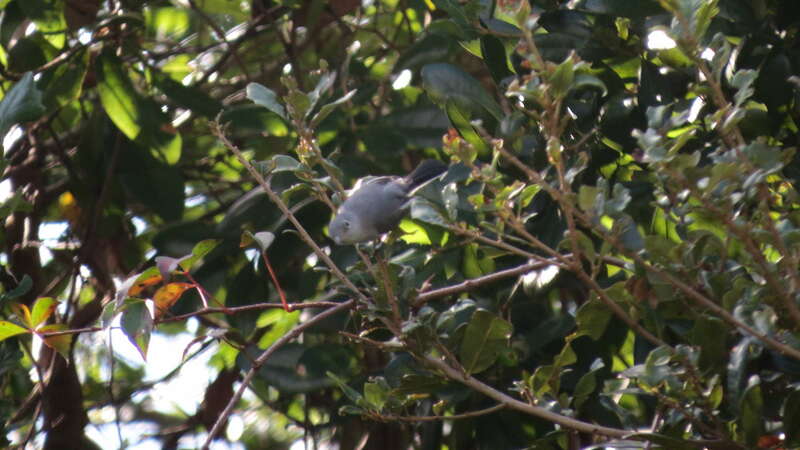 At the gardens we saw more Palm Warblers, a Bald Eagle mobbed by grackles, and a quick two-second glimpse of a Gray Catbird! No way! I once drove a great distance to Eastern Washington in search of a Gray Catbird to no avail. It’s that easy, Florida? Okay, then. Returning to the house, we got a big surprise. 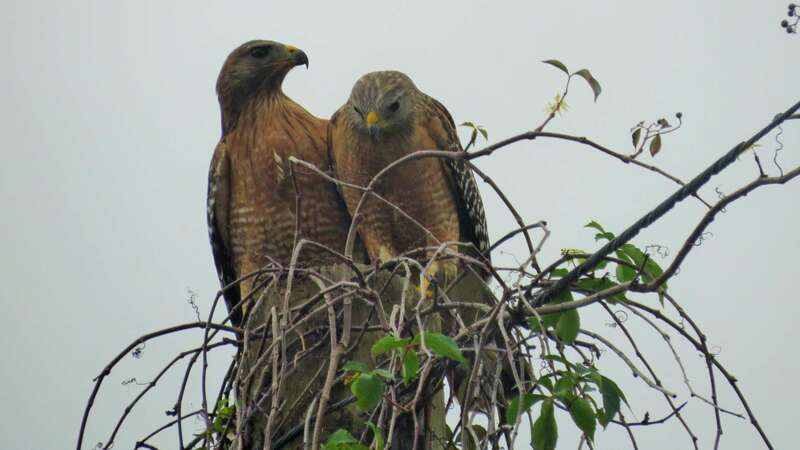 Red-shouldered Hawks! These birds were on my I-hope-to-see-these-in-Florida list and here were two perched on the light post just outside the house. How cool. They flew to the top of a parking garage, then returned later to a nearby pine tree. What a gorgeous pair of birds. Not bad for a quick walk around the neighborhood. But that’s not all! I couldn’t get enough, so I returned to the USF campus to wander around, thwart campus security, and chase flocks of birds. Because that’s what you do when you’re in Florida. 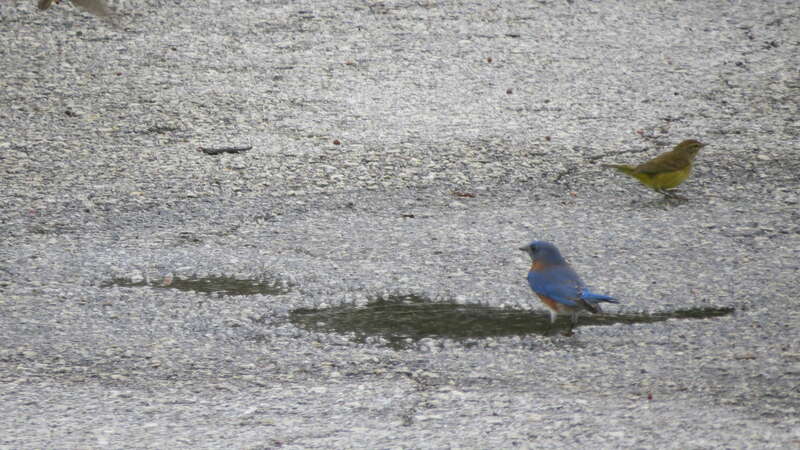 I followed this flock to get a better look of the Eastern Bluebird. (and Palm Warblers in background). Nice! I also noticed a small black and white bird that was totally a nuthatch but not a nuthatch. Once I read the description in Cornell’s Merlin Bird ID App, “creeps along branches like a nuthatch, searching for insects,” I knew this was a Black-and-white Warbler. (I’m curious why it’s not called a Black-and-white Nuthatch; something to do with genetics?) The genus Mniotilta (nee-o-TIL-ta) is Greek origin from mnion, moss, and tiltos, plucked. The Black-and White Warbler (Mniotilta varia) uses moss to construct its nest. 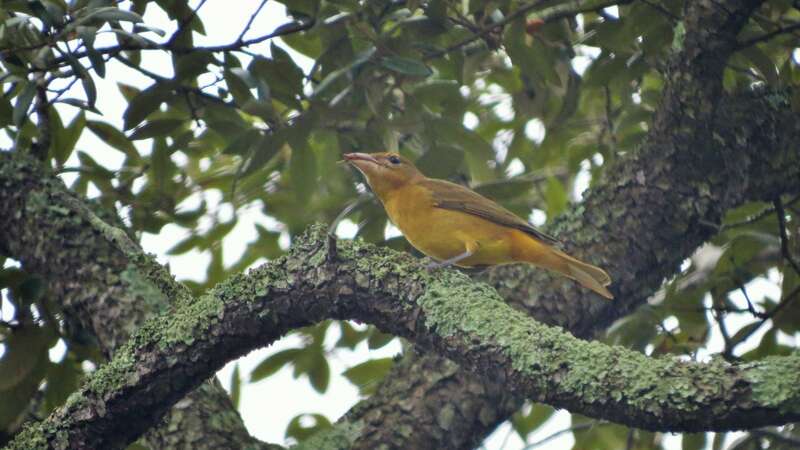 I saw a female Summer Tanager (wish I’d seen a male too!). They use their large bills to catch wasps and bees on the fly. I wonder if that’s what she’s munching on. 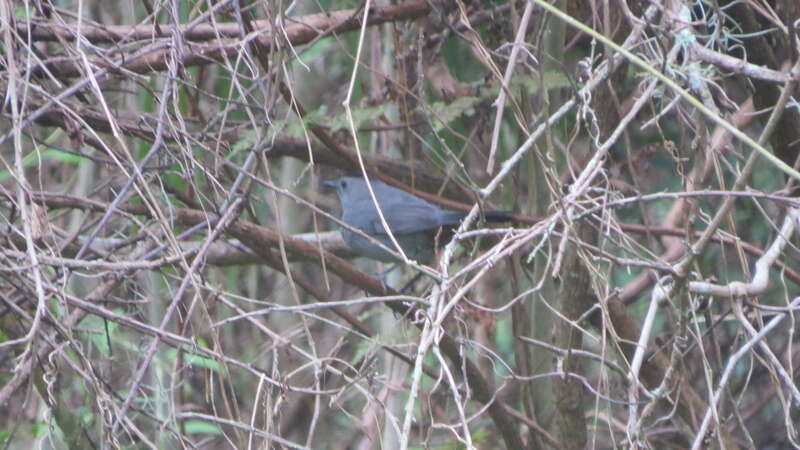 I saw another insect-lover, the Blue-gray Gnatcatcher. 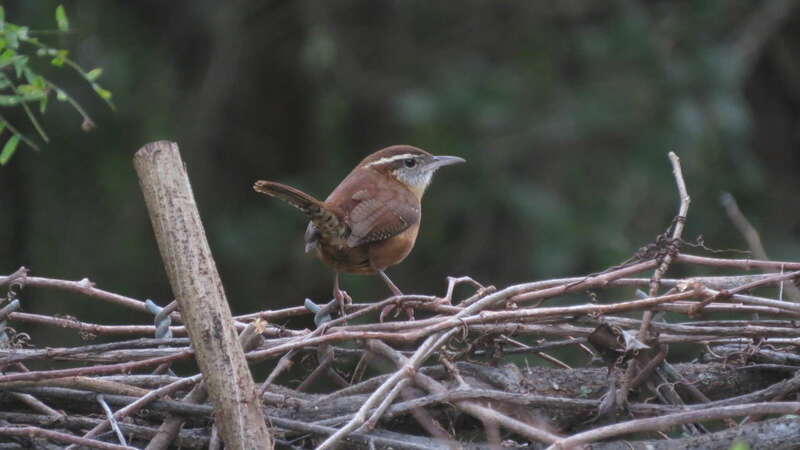 And if that weren’t enough, I returned to the house to find a Carolina Wren in the yard (looks like the eastern version of the Bewick’s Wren). 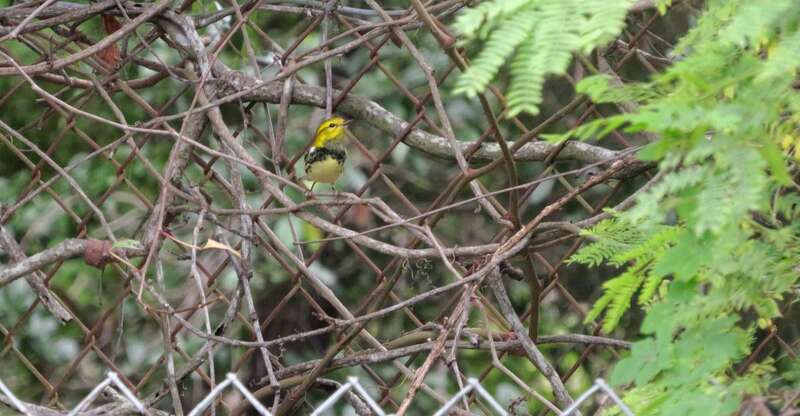 AND a Black-throated Green Warbler! So pretty! It was icing at this point. I watched the attractive little warbler catch insects around the ferns before flying far away to the treetops. I lived in Florida for eighteen years, but I’d never seen its beauty in this way. I was always too focused on the heat, traffic, bugs, tourists, and moving as far away as I could. The change in perspective was refreshing. Satisfied with my first day acclimating to New Florida, I looked forward to seeking out the beauty of the next day! This entry was posted in Birding Trips and tagged Black-and-white Warbler, Black-throated Green Warbler, Blue-gray Gnatcatcher, Boat-tailed Grackle, Brown Thrasher, Carolina Wren, Common Grackle, Downy Woodpecker, Eastern Bluebird, Eastern Phoebe, Gray Catbird, Northern Mockingbird, Palm Warbler, Red-bellied Woodpecker, Red-shouldered Hawk, Summer Tanager, White Ibis, Yellow-bellied Sapsucker by audge29. Bookmark the permalink. Good grief these are two jealousy-inducing posts! 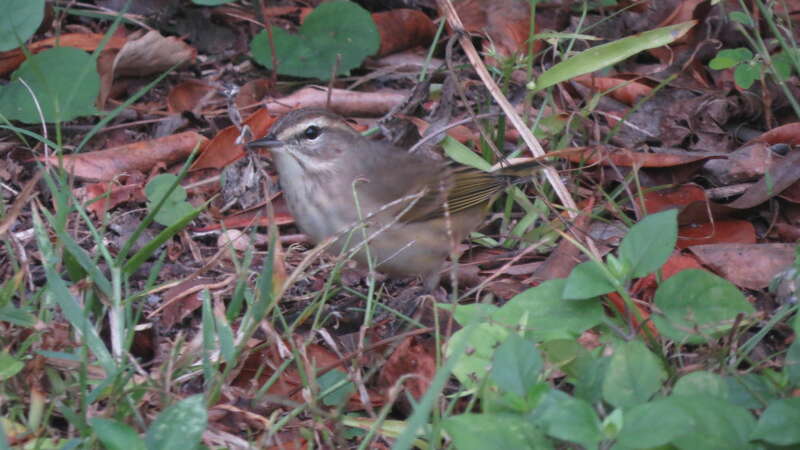 Palm warblers blanketing the ground? 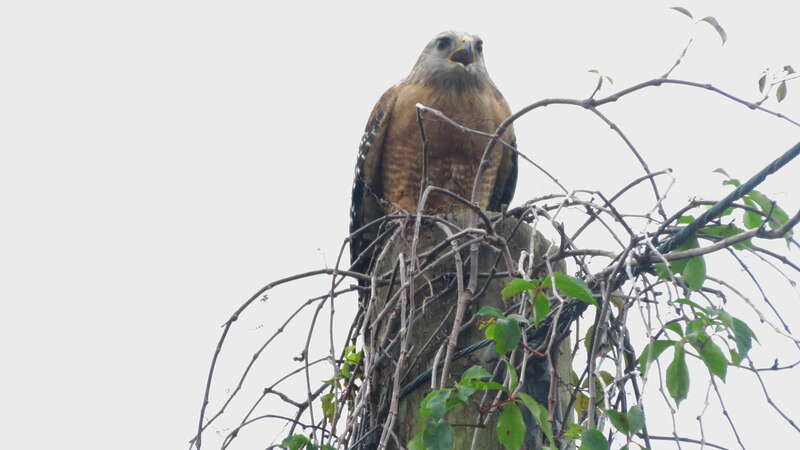 RS hawks just hanging around? And your skimmers are just wonderful…I have not seen that bird, and I have barely ever been on a beach that didn’t require foul weather gear! Jen S. went to Florida a while back and came back with similar amazing birdiness. Shoot, I gotta go to there.